Our work has seen us travel throughout the county in recent weeks, completing a variety of different jobs. We’ve even completed an installation the Ministry of Defence – laying new flooring in the toilet blocks of RAF Honington. We were asked to replace the flooring of the male, female and disabled toilet blocks. 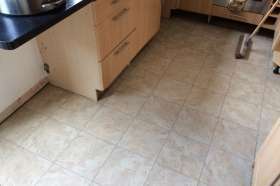 The existing flooring had become worn out after years of use and need replacing. Due to the dangers posed by slippery floor, the MOD wanted anti-slip flooring that could withstand constant use. We showed samples of our products and they chose Forbo’s Surestep Original Safety Vinyl flooring. The three bathrooms covered a large surface area and there were lots of fixtures and units we had to work around. It was a tricky job, but one that our team completed with no issues. 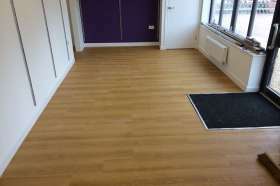 We fitted the flooring with a 100mm cap. We also used coved skirtings. The floor covering is rated R10 in anti-slip ratings, making it the ideal choice for the bathroom area. The safety flooring installed underneath the urinals in the male toilets. This job was very enjoyable to be a part of and working on the site was an interesting experience. It was a slightly different setting to what we are used to, but this new surrounding made the job a memorable one. It was a challenge our team dealt with expertly, so much so that the MOD have invited us to complete work on the kitchen area and the areas leading off of it. We would like to say thanks to the Ministry of Defence for the job, we are looking forward to working with them again. We install flooring for commercial and domestic buildings as well as military ones, call us on 01603 879359 or email us on sales@reformflooring.co.uk.